Queen's Mill01977 556741work Heritage CentreSitting on the banks of the River Aire, Queen's Mill (also known as Allinson's Mill) was once thought to be the largest stone grinding mill in the world. According to the West Yorkshire Archaeological Society there has been a working mill by the river Aire as far back as Roman times. During medieval times the mills were used mainly for milling wheat, just as the Queen's Mill continued to do until 2010. 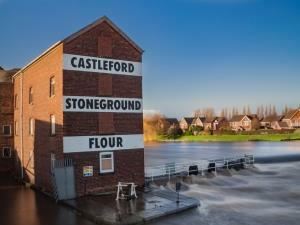 Now Queen's Mill is looked after by the Castleford Heritage Trust. Visitors are invited to explore the mill during special open days throughout the year where members from the trust will be on hand to share the history of the mill and answer any questions. Pop into the licensed Queen's Mill Tea Rooms serving quality tea, fresh coffee, wine and locally brewed beers. Afternoon tea, homemade cakes and light refreshments are also available. Sitting on the banks of the River Aire, Queen's Mill (also known as Allinson's Mill) was once thought to be the largest stone grinding mill in the world. The tea rooms are open Thursday - Saturday: 10am - 4pm, Sunday: 11am - 4pm and Monday: 10am - 4pm. Please see website for dates of special events and open days.